I started babysitting when I was 12 years old and treated it like it was my full time job - even back then I was extremely money conscious. I would take every single babysitting opportunity that I could and I kept a spreadsheet on a piece of looseleaf of the date, how many hours I spent with each family, and what I made each time (I actually still have it in a box at home). I was pretty spoiled as a child, I'm the first to admit it, and yet I hoarded my babysitting money away like I was living during the Great Depression. My family constantly made fun of me for it but I didn't care. It should come as no surprise that I still keep track of every single cent that I make and spend in a little notebook that goes everywhere with me. Last year was a hard year for me financially - Krickit cost me over $1,800 in medical testing (the joys of being a pet owner! ), I had two wisdom teeth extracted and my insurance only covered a portion of the $2000 cost, I (finally) got braces and had to pay a $1,200 down payment (and not a single cent of the entire $6,600 is covered by my insurance), and also had to have three other teeth extracted after my braces were put on. It was just NOT a good year financially. I've been saving to buy myself a house for a couple years now and it started to feel like it was just never going to happen. On the flip side, since January of last year I have been to Minneapolis 4 times, Las Vegas 3 times, and Texas once. You may be scratching your head right now, thinking that I'm a little bit crazy and thinking 'how does she still travel so much when she's supposed to be saving to buy a home?' My response when I'm asked this is always the same. I REFUSE to keep travel out of my life - it's just not an option. I would rather have to rent for the rest of my life than not be able to travel. I live in the middle of nowhere and travel is my only escape - I would actually go crazy if it weren't for the trips that I take. There is just no way that I will cut travel out of my budget. Period. (I posted back in April about ways that I save money while traveling - you can check it out here). My Grandma had a saying that has stuck with me since the first time I heard her say it 'You can't take it with you when you go'. After hearing that I let go of my tightwad tendencies a bit and loosened the purse strings and let myself use my hard earned money to enjoy life, not to just look at it in a bank account. So, when it comes to my budget, travel savings is a HUGE part of it. After another tight year financially thanks to being MOH in my brothers wedding coupled with adding in another payment each month for my braces I decided to take on a part time job in 'the city' in August to offset the cost of my braces and allow me some extra income each month. Everyone thought that I was crazy since its a 40 minute drive to 'the city' but I am loving it and having that extra money each month lets me breathe a little easier each month! I have a travel fund, emergency fund, and savings account set up through my Credit Union, along with my chequing account. I get paid biweekly at each job so it works out that I get a paycheque every week. All of my part time job earnings goes towards my emergency and travel funds, as well as towards Christmas 2015 savings. Normally I like to start saving a little earlier for Christmas but since this was another tight year I didn't start until I got my first paycheque from my part time job. I have a braces payment, car payment, car insurance payment, & cell phone payment that are my largest payments out of the month and equals to one paycheque from my full time job. The other paycheque goes towards smaller payments, things like Netflix, some blogging expenses (PicMonkey, Rafflecopter, etc. ), groceries, fuel, and then a large chunk goes to my savings for my down payment. Any leftover money after all of that gets taken out of my account and I pay with cash for things like eating out, coffee stops, etc. I also follow the $5 savings plan and save each $5 bill that comes my way. Last year I saved $735 dollars in $5 bills and I hardly carried cash at all at that time! 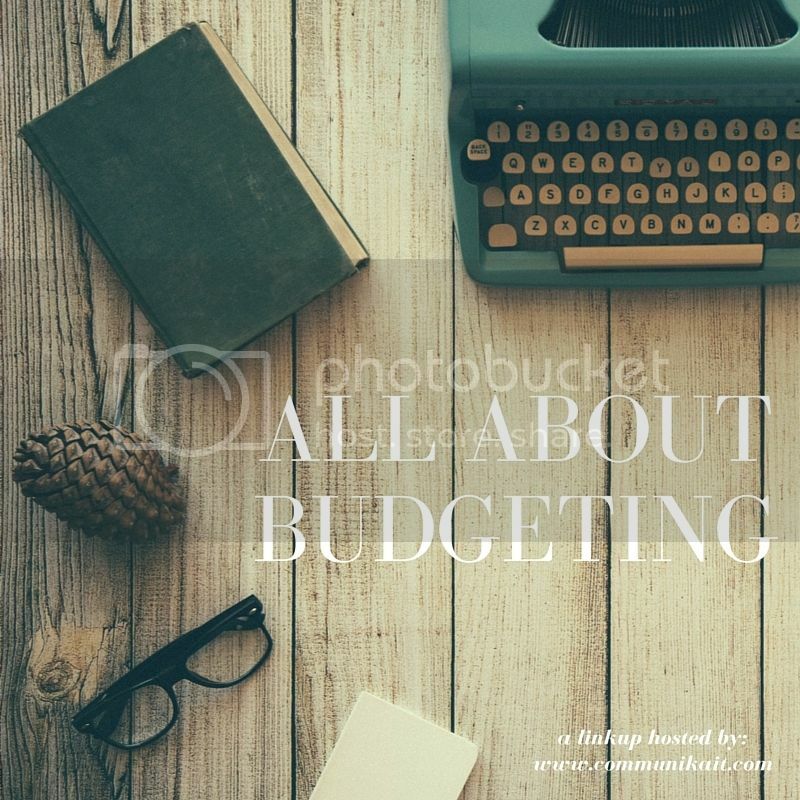 Some months I go over budget and have to move some money around from account to account but I find that having everything budgeted out each month has really helped me stay on track most of the time. I put myself on a really strict budget in September, with hardly any extra money leftover each money for things that aren't necessities, in the hopes to boost my savings my quite a bit by the end of December. Living on a budget can be hard sometimes, and there are definitely slip ups here and there, but it is so worth it to me. Knowing that I have money in savings in case anything were to happen with my health or my job and I wasn't able to work also lets me breathe a little easier. I also have to say this: my parents are the absolute BEST and let me and Krickit take over their basement so that I can save money that I would be spending on rent to go towards my down payment savings and I owe them SO much and will probably never be able to repay their kindness. They bought me my first car, paid for my college education so I didn't have to take out Student Loans, and are now letting me live with them and take over their entire basement so that I can save. They rock and are my rocks. Come January 2016 I will be revamping my budget a bit - I like to use Gail Vaz Oxlade's Interactive Budget Worksheet when doing up my budget to help me figure out what percentage of my income I should be spending on certain things, what percentage I should be saving, etc. I'll be doing a report on my progress in early January so make sure you stop back then to see how I did! I'll stop now because this has already been long winded and there is still SO much more I could write about. Let me know in the comments what your number one budgeting tip is - I'm always looking for new ways to save! my tip, or rather, how we live our life, is pretty vague and general, but it's live below your means. i want a bigger house, a longer trip, a nicer car.. but whenever we do something, want something, buy something.. we try and take it down a notch lol so it's always below what we think we can afford, if that makes sense. i'm like you though, i refuse to take travel out of my life! not gonna happen. I needed this! I love reading budget/saving posts. Once our lease is up, we're moving to a cheaper place and I am so ready to start saving for a house!!! I like the idea to save all $5 bills! Traveling is important to me as well. there are many, many "things" that I do not buy - so that I can travel. Hey K! I think you really are an inspiration to these kids today who blow through their allowance before they even let it settle in their pockets. I was the same way as you growing up, and today even though money is tight, I will never let it come between me and traveling. No matter how tired, depressed, or frustrated I may be, just thinking about planning my next vacation is like a shot of adrenaline. This was a fantastic read. I just graduated from college and this year will be the first year I do taxes for. I have been so overwhelmed by how it all works. And then there is the issue of budgeting. I have never been good at it at all but I suppose I will just have to start doing it.